Jeremy Durnford, Spider House's general manager, talked to us about what makes Spider House so unique, and how it fits into Austin's LGTBQ community. What do you think has been the secret or key to Spider House's success? I believe the key to Spider House's success is that it is a place that ANYONE can come and be themselves; gay, straight, black, white, man, woman, etc. It is a place to gather and express one's self openly, without any fear of being judged or ridiculed. Spider House has always been open to all types of people from artists to musicians to students who just want a cup of coffee and a quiet corner to study in. 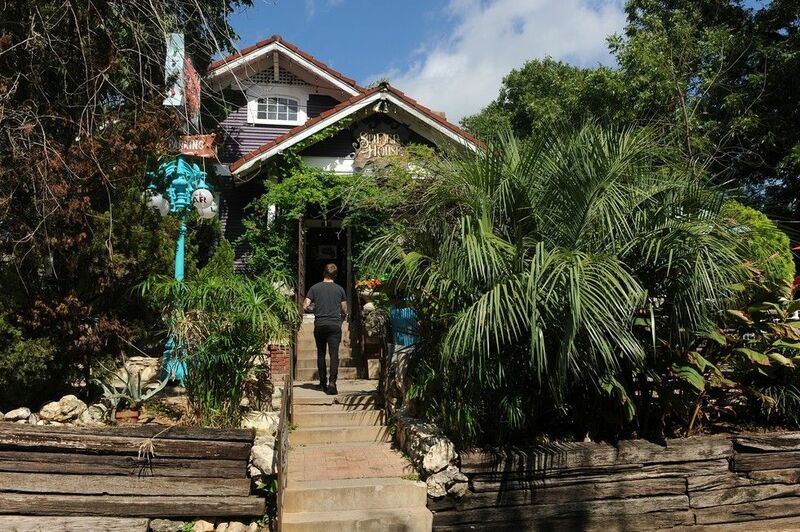 Spider House is one of the last Austin Originals, and we plan to keep it that way. What is the quintessential order, or particular menu item that you're known for? Or is there a particular event or party that is Spider House's signature? Spider House is known for its variety, from live music to our weekly poetry slam and open mic nights inside the Spider House Ballroom, to our large tree covered patio that is lined with tons of antique odds and ends, where you will find more live music, trivia and people just having a good time at the Spider House Cafe. During the cold months we even have a gigantic fire pit to keep our guests warm. We have several food trucks that are located on our property as well as tattoo shop. No matter who you are there is something for you at Spider House. What's unique about running a business in Austin? What about Austin and its community has helped Spider House thrive? As Austin is a fast growing city there are always new challenges to grow but at the same time stay as close as we can to our old Austin roots. Austin's population is so diverse that it makes running a business here always interesting and exciting. The different types of people I get to meet on a regular basis never ceases to amaze me. I believe Austin has helped Spider House thrive, mainly because it is such an open community to all types of people and that is exactly what we intend to do on a regular basis, create a community environment for EVERYONE!